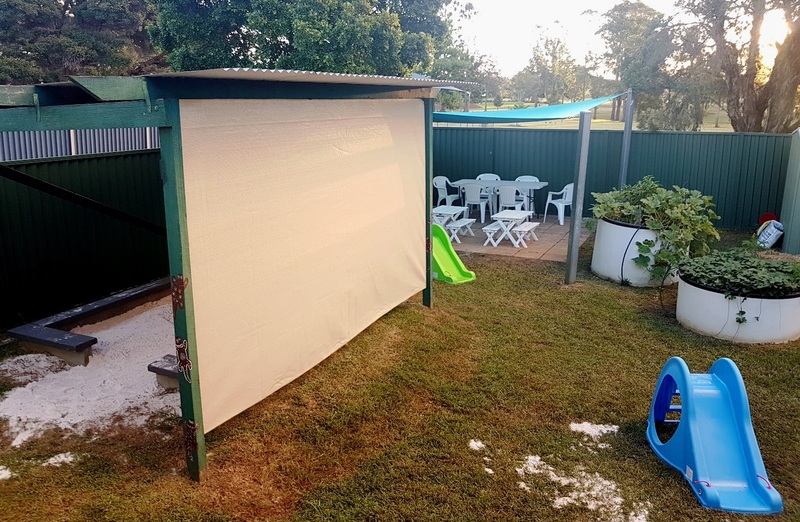 In the days following the recent flood in Lismore, Family Support Network was approached by staff from the local Bunnings store with an offer of flood recovery assistance. 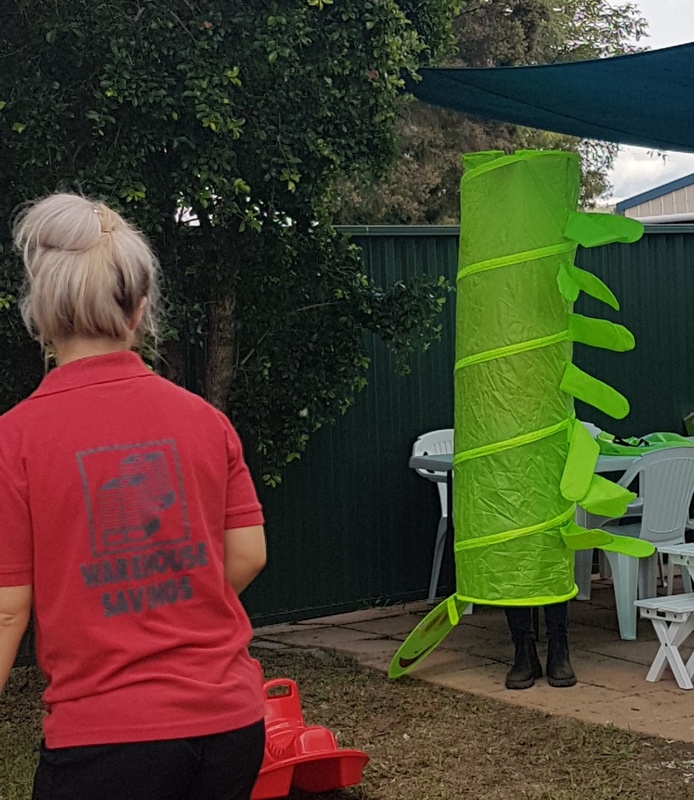 Bunnings management wanted to assist the local community to recover from the devastation caused by the flood and they felt the best way to do that was to assist an organisation whose business it is to help the community. 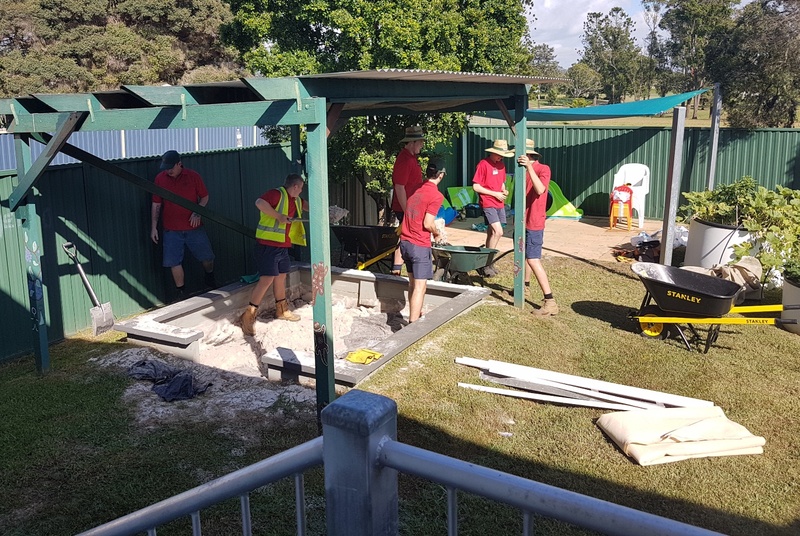 The Bunnings team co-ordinated by Roberta Maslen turned up in large numbers and totally revamped the outdoor area of our South Lismore premises. 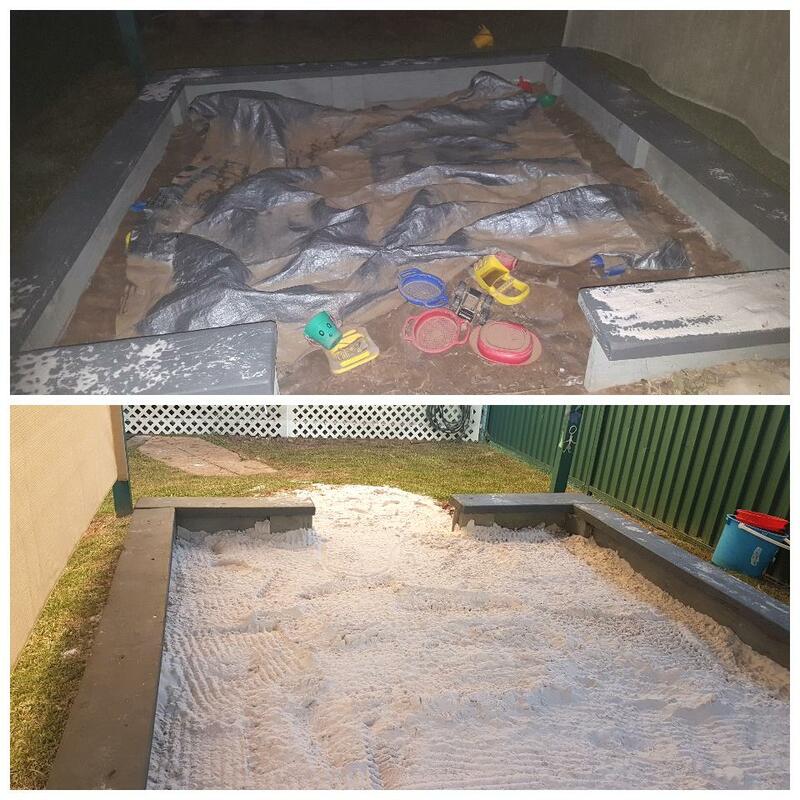 Bunnings replaced the flood damaged sand pit, outdoor furniture and play equipment and threw in a few additional surprises such as lattice screening, plants and garden materials. 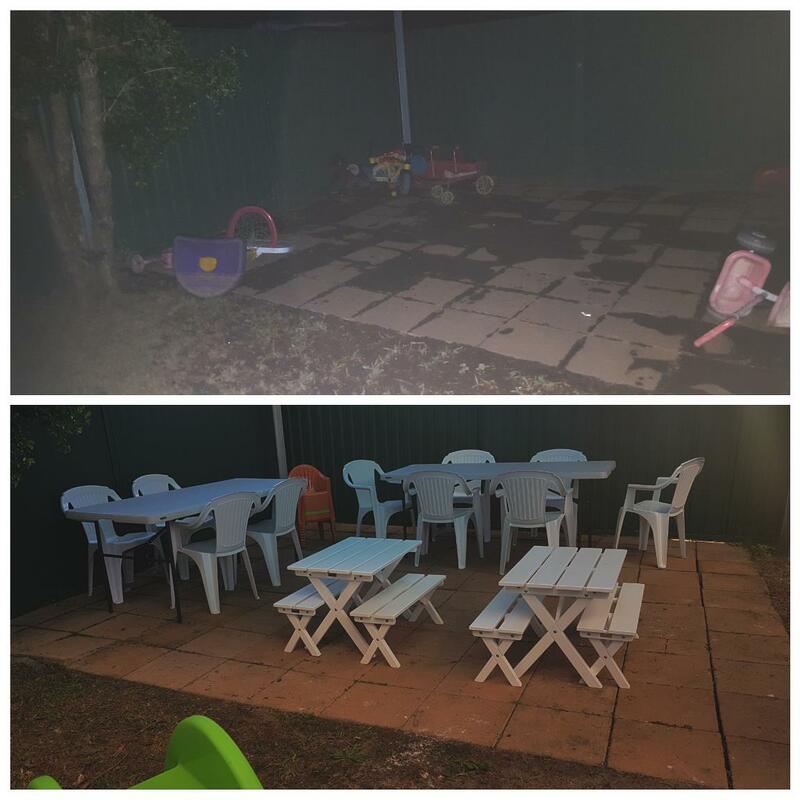 Parents & Children coming to playgroup have enjoyed the lovely wooden cubby house! The board, management and staff at FSN are extremely grateful and appreciative of this wonderful corporate gesture by Bunnings. We would encourage all our families to support them in return of their magnificent support of our community, in these trying times. Family Support Network Inc is proud to announce the establishment of its Student Placement Program. Specifically this is a commitment to the regular placement of students each year who are studying tertiary courses in Social Science, Welfare, Community Services, Counselling or even Administration or Management. 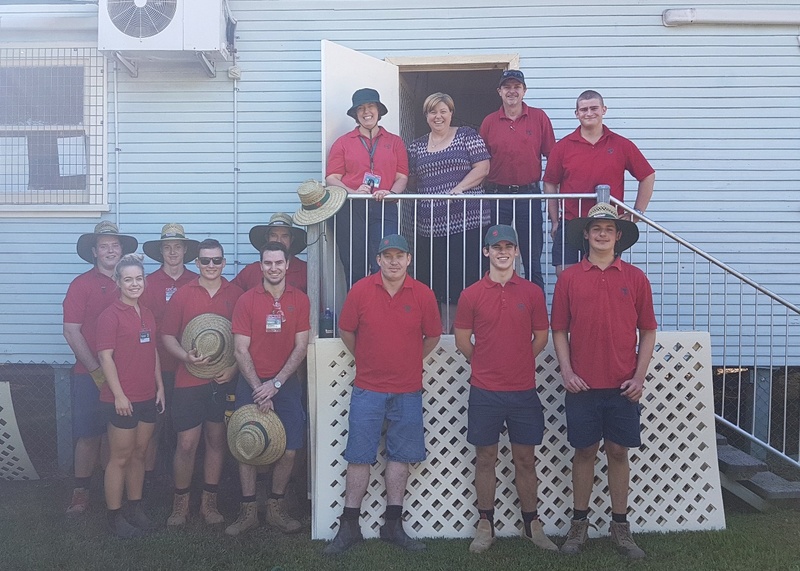 Our organisation wishes to give back to the local community via the acceptance of student work placements, thus enabling these students to complete their studies, obtain their qualifications and join the workforce. We recognise the importance of training new professionals for the welfare sector. We value the benefits that new research can bring to learning and that student placements can bring with them these new learnings. We also believe this initiative assists in ensuring that across our local district there will be a constant pool of ably skilled and qualified individuals within the welfare sector. We believe that this coupled with our internal training and our professional development practices will help to keep FSN and its staff at the forefront of innovative service delivery via the transfer and implementation of new learnings. Consequently, this will assist in ensuring that our clients will have enhanced access to the latest research, learnings and practices. I undertook 500 hundred hours of placement with FSN for my Bachelor of Social Work. I was able to improve my skills by being invited to engage in such activities as; co-facilitating parenting programs, home visits, interagency meetings, case conferences, client intakes and assessments. Working in such a supportive environment has been truly wonderful, especially for a first placement, where I was still trying to find my feet. The Family Work team has been so kind in sharing their knowledge and experiences with me, which was a truly priceless experience. The Families NSW team has also been extremely generous, offering me opportunities to participate in activities and programs they run. The admin staff has been an invaluable resource, helping me to learn even the simplest things, like sending a fax. The general manger provided me with insight into how the organisation was run and relevant legislations. The Case Work Manager offered wonderful insights and practice knowledge, her wisdom was truly instrumental to my learning experience. Overall, the Family Support Network has been an amazing organisation to have undertaken my placement in. I will be truly sad to go. 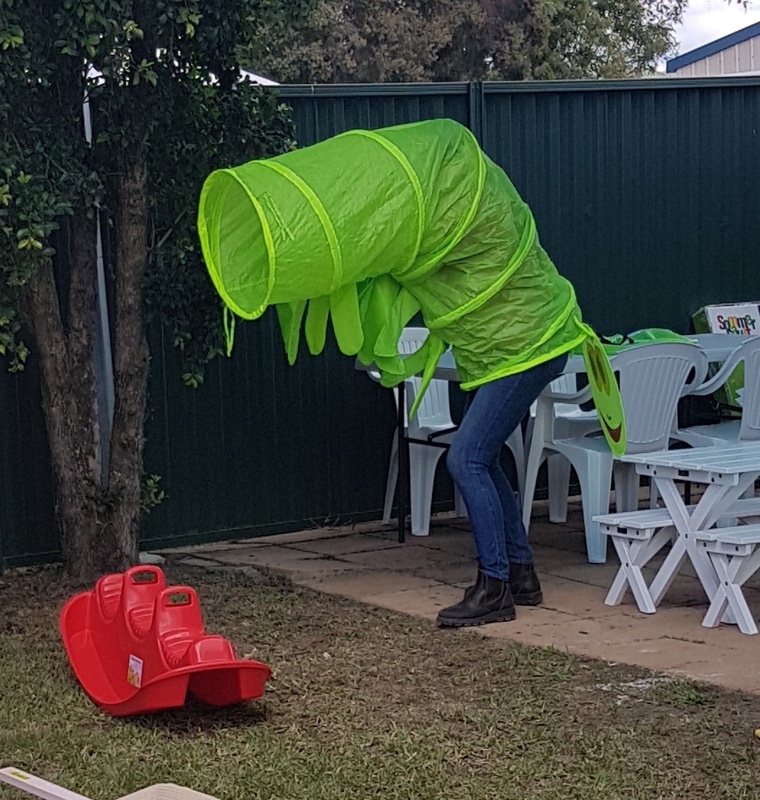 I have been doing a Masters in Social Work student placement with the Child, Youth and Family Program at the Family Support Network for the last 2 months, and it has been an engaging and rewarding experience so far. I have had the opportunity to help facilitate a parenting program, attend home visits to clients, participate in case planning activities and case conference, attend sector forums, participate in planning a local community Child Protection Week event, and assess clients for intake. 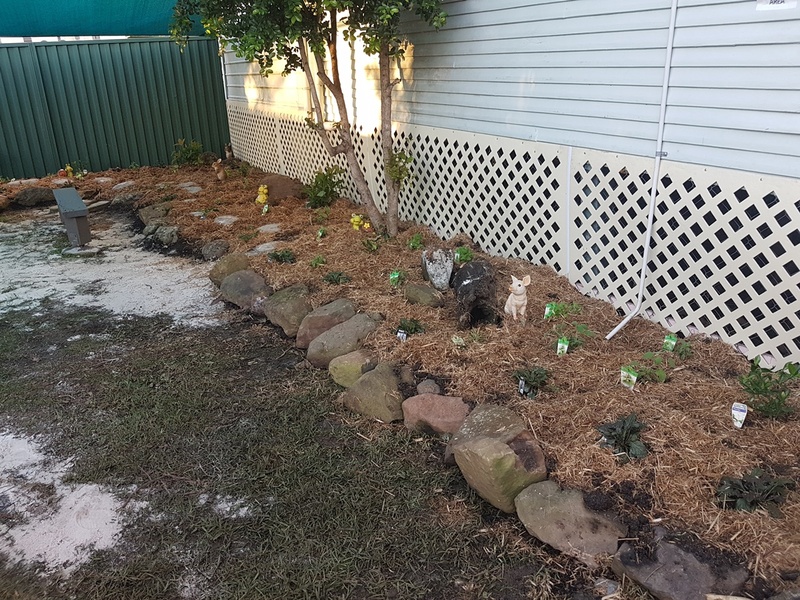 I have also had the pleasure of learning from very experienced and knowledgeable workers, who have high levels of passion and skill in this work. I still have a month to go, and know that this experience will serve me well in my future work and studies. I completed a 450 hour student placement as part of my Master of Social Work at Family Support Network in the Family Work team in the first half of 2015. I thoroughly enjoyed my time at FSN and was given the opportunity to participate in many community events, interagency meetings, parenting programs and home visits. FSN provided me with a great learning environment and a real insight into family work. Thanks to my experience at FSN I am now looking to pursue a career in family work and continue my learning journey. It was a privilege to undertake my placement at such a welcoming organization and I cannot thank everyone enough for all their support and assistance. I undertook my first 200 hour block of placement with the Start Together Program at Family Support Network (FSN) in 2015. I have always had an interest in working alongside families to support children, so working in a program that encouraged and empowered parents in their own skills, was an amazing experience. Completing placement at FSN helped me to develop my skills and see how university transferred into real life. However the best component about having placement at FSN is that it provided a supportive environment with people who were open and willing to share their knowledge and experience to help me grow as a worker. Placement at FSN continued to increase my passion for wanting to work in this area and the skills I learnt at FSN will be ones I will continue to use throughout my career. I approached Family Support Network to enquire about doing my placement for a Counselling Diploma with the thought that family work encompassed most issues that humans encounter. In the first interview I was encouraged to hear of the different possibilities for learning and practice. Coming from over 3 years of one on one telephone experience in a crisis call centre, I found the change to face to face client meetings to be very enjoyable. The privilege of meeting people in their homes gave me a greater picture of their lives and concerns, their art work and their sources of joy. All round case work has been something that I have learnt here including paper work, notetaking and workers discussions. The workers have been generous in including me in their work practices and sharing their knowledge. The admin people have been very patient and supportive. Supervision has been especially enlightening. I was able to trust the supervisor with tentative thoughts about counselling, reflections and concerns and always receive thoughtful answers and ideas that encouraged further curiosity. The focus on parenting skills at FSN has been a great opportunity to learn about parenting in the Group Programmes and Playgroup. Overall the job of Family Support Worker has a balance of meetings, client contact, group work, computer work and reflection supported by regular case meetings and supervision. The variety made for very interesting work that relies heavily on good communication and team work. I have found Family Support Network to have a caring atmosphere and exciting programs for learning. I am grateful and feel very blessed to have done training here. Our Annual Reports tell you about our performance throughout the financial year. Each year, we detail our financial records and also include stories about the positive effect we have on local families. Our data collection is telling us, how well we work with parents to improve child safety & family wellbeing. Our Annual Report for 2017-18 is available here - download the 1.4MB pdf file. Audited Financial statements for 2017-18 are available here as a 1.2Mb pdf file.